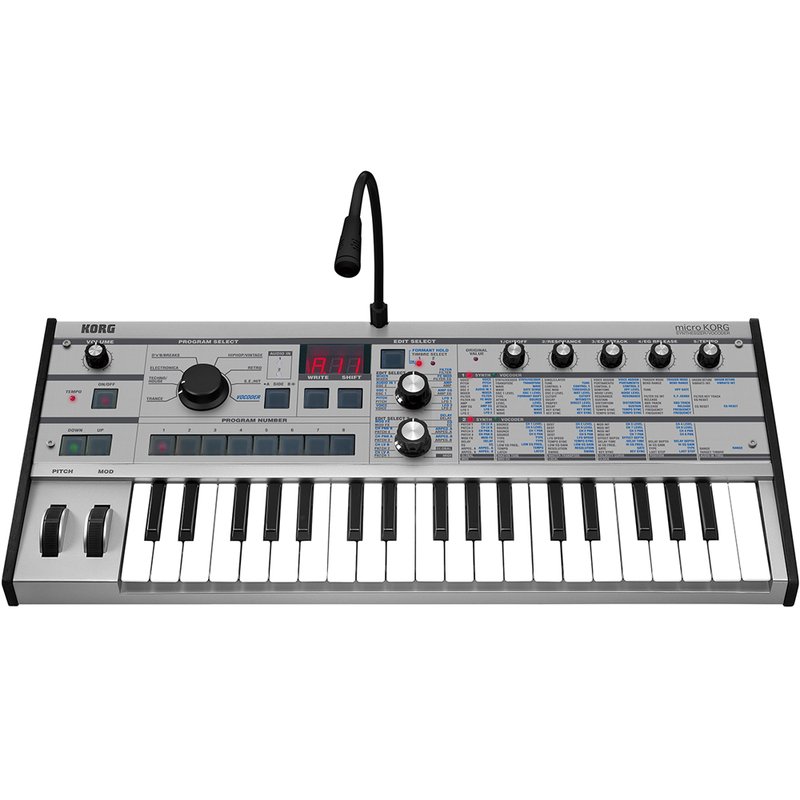 The microKORG Platinum is a compact-sized synthesizer that delivers the true enjoyment of synthesis. Underneath its small exterior lurks an amazingly powerful synthesizer. It is fun to play, and it delivers a sound and functionality that will satisfy everyone from the beginner to the professional. Welcome to a world of unlimited creativity. 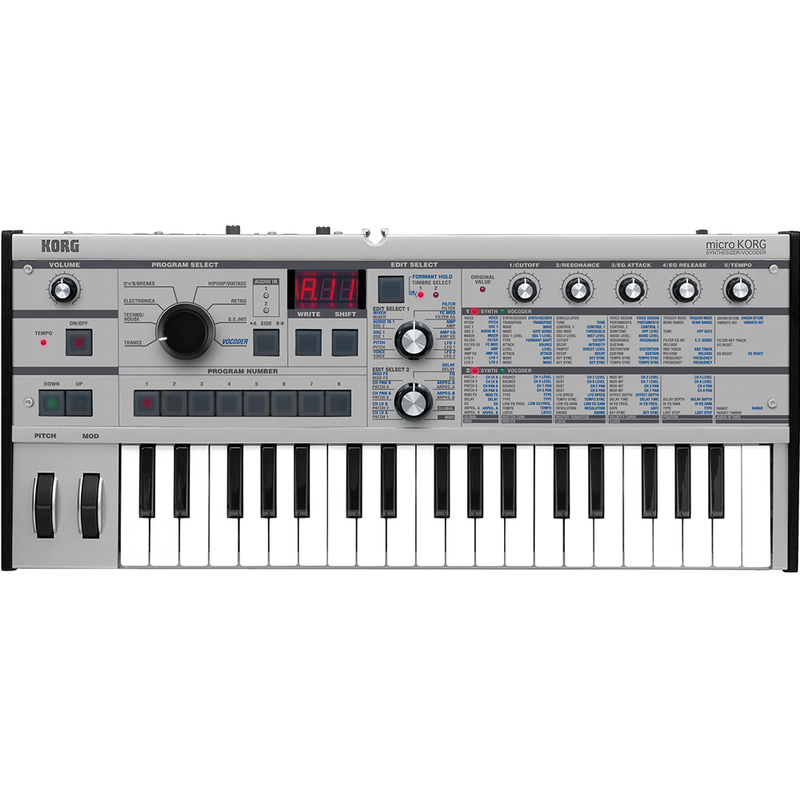 The microKORG contains 128 programs covering a wide range of current and classic synth and vocoder sounds. From the warm and rounded tones characteristic of analog modeling, to sharp and extreme sounds, you can easily access the sounds you need, thanks to the clear genre categories that the sounds are organized by. Just select the music style/sound category you want and pick a sound! Once you select a sound the five knobs will control the most important functions you would want in performance for immediate results. The microKORG provides three types of modulation effects (chorus/flanger, phaser, ensemble), three types of delay effects (stereo, cross, L/R), and a two-band equalizer to add the finishing touch to your sound. The delay effect can be synchronized with the arpeggiator or an external MIDI clock, a great feature for live performances and groove- oriented music. All effects can be edited simply by turning knobs to create your own unique sounds. Dimensions (W) x (D) x (H) 524 x 232 x 70mm/20.63" x 9.13" x 2.76"